You’ve been tasked with finding the best LMS for your business and it’s a little overwhelming. With over 1,000 learning management systems on the market, it's impossible to test them all. Initially, it seems complicated to know which LMS is right for your learners and organization. However, if you take a closer look, in reality, there are probably less than 5 LMSs that actually suit your needs - you just have to find them. By asking the most relevant questions, this guide will show you how to focus your search. We'll help you filter out the unsuitable solutions, and pinpoint the best learning management system for your business. A common thread we here at LearnUpon see prepared businesses do is determining their learning and development goals. This simple act makes the search for the best LMS that little bit simpler. Ask yourself: What skills do you want your users to learn? What do you want them to achieve by eLearning through an LMS? What are your learners expecting to take away from their training? Once you have a concise eLearning strategy in place it's a more straightforward search. You'll know what you need your organization to achieve with an LMS solution and you'll have a clearer idea of how to meet those needs. A crucial step in choosing the best LMS is to keep your learning audience in mind during the selection process. They’re the ones who will be using the system after all. The success (or failure) of your entire eLearning strategy depends on learner experience and engagement. A non-tech savvy learner will need an intuitive, easy-to-use LMS. An employee who works out-of-office will need a mobile-responsive, accessible solution. These are important considerations that impact your final decision. No two audiences are created equally too. What works for employee training might not suit customer education or partner training. Or, you might need to train multiple audiences all within the one system, then you’ll need a dynamic, multi-portal system that suits each audience. So, find a solution that is configurable for your distinct audiences to ensure you get the best results. What’s the best LMS platform for your industry? With so many LMSs on the market, a quick way to narrow down your options is by industry. There are a number of LMSs that cater to specific industries. For the higher education market, you’ve got platforms like Canvas, Blackboard, and Moodle. These are built with a focus on teaching and learning processes that cater to schools. Others cater to pharmaceutical and health, SMBs, manufacturing, telecommunications, and so on. Additionally, some, including LearnUpon, provide a solution for all industries - enterprises, software, training companies, etc. At this stage, it’s vital to do your research; check out online vendors reviews to see what similar businesses are using, and analyze which providers have a good reputation in your industry. It’ll give you lots of insight into what vendors you should narrow in on. Is Cloud-Based or Self-Hosted better for your organization? Another question that will immediately narrow your search - is a Cloud-Based LMS or a Self-Hosted LMS better for your organization? This is a decision based entirely on what your business needs. There are pros and cons to both. With cloud-based, most of the technical work is done by the LMS. Businesses don’t need to worry about installing hardware and allocating resources to manage it. For managers and learners, it’s simply log in and go. However, a self-hosted platform works if your organization must follow the same architecture across all platforms. Although, this leaves you and your team handling applications, like servers, databases, resources, and budgeting. If your company needs the LMS to grow with you, cloud-based is a smart choice. These platforms are flexible and adapt to you growing from 1,000 to 10,000+ users easily. Self-hosted platforms can be expanded, but it's up to your internal team to manage activity and storage as user numbers grow. What LMS features do you need? Ease of use: Most organizations have both experienced and inexperienced people using their LMS. Therefore having an LMS that is simple and intuitive to use is key. Ease of use saves you time and ensures your learners can engage with your LMS with limited input from you. 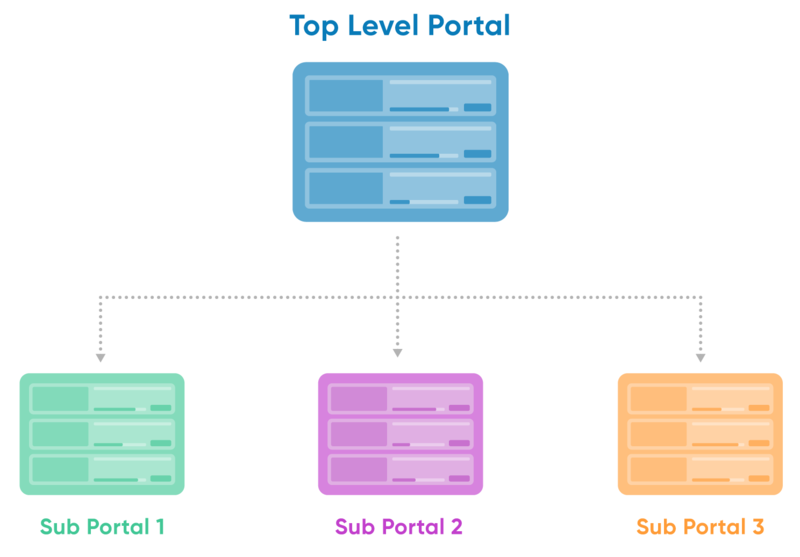 Multi-portals: If you have multiple audiences to train, choosing an LMS that allows you to set up multiple portals, all managed with one login is a must. This makes life easier as you can train audiences in their own dedicated portal. Branding and White-labeling: The best LMS should allow you to brand the portal with your own colors, logos, and banner images to create a familiar environment for the learner. White-label too so you can choose your own URL and remove any mention of the vendor from your LMS portal. Learning Paths: Learning Paths empower you to easily enroll learners in paths of courses so that you can plan out months of training with little need for ongoing enrollment or management. Learners will work through the path whilst you get on with other tasks. Reporting: Reporting allows you to track course progress, exam performance, and training histories of your learners. Make sure you can export this data - with the ability to automate this process being a massive bonus. Integrations: Seamlessly connect integrations with your LMS, allowing your organization and learners to automate and scale training with the software you’re already using. Some examples include SSO integrations, API integrations, and many more. Support: Implementing an LMS in your organization takes time and money, so it’s vital that your vendor has excellent customer support. Ask your shortlisted candidates about their support hours, the average response time, etc. so you’ll be confident you’ll never be left alone. Reliability: When investing in software, it’s important to ensure it’s reliable, and that your organization and its learners have constant access to your LMS. SCORM and xAPI Compliant: Managers and admins can upload SCORM and xAPI files (standards of eLearning that can help you to make eLearning content more interactive) and roll them out within seconds. Gamification: Adds fun and motivation to courses, therefore creates healthy competition, emphasizes goals that have been set, and increases course adoption and completion. Gamification can be done through points, badges, levels, and leaderboards. Responsive Design: With mobile learning becoming accepted as standard, many companies want their learners to learn on any device, at any time, from anywhere. How focused are your potential LMS vendors on training? When it comes to the best LMS platform, there is a product divide - a company that’s focused solely on an LMS or a company whose LMS is a smaller part of it's product library. When a company is solely building an LMS, all their time and effort is put into building the best features for their users. A vendor that offers an LMS as part of their product library may not focus as much energy on their LMS, meaning it may be lacking in the key features you need. Even if the features you need are included, it may not be as refined as with a sole LMS focused vendor. A sole LMS provider may offer you a platform that is more user-friendly and intuitive to use. Additionally, you may end up paying for extra products and features you don’t want or need with a multi-product LMS vendor as it can be part of a bigger package. If you go with a sole LMS provider, you only pay for what you want and need. With all of these questions asked and answered, you should be able to pinpoint the suitable solutions and find the best LMS for you. However, if you’re still struggling, reach out! For example, here at LearnUpon, we welcome calls that help you discover if we’re the right solution for your business. A 15-minute quick chat with a team member is an investment that can save you days in wasted searching. If we’re not a good fit, we’ll point you in the right direction. That way you will get the best learning management system for you and your learners.